As we approach the completion of our SARE project implementation, we have conducted surveys of past SARE PI’s and have just launched a re-designed Tools section of the website. The new version is intended to make both documenting tools and finding the tool you are looking for easier and more effective. We’ll be hosting a community webinar on two dates to provide a live walk-through of the new Tools Section to help familiarize users with the new features and get your feedback. We hope you can join us for one of them. These webinars are free. No registration is required. There will be time for Q&A. The sessions will be recorded and posted on Farm Hack. 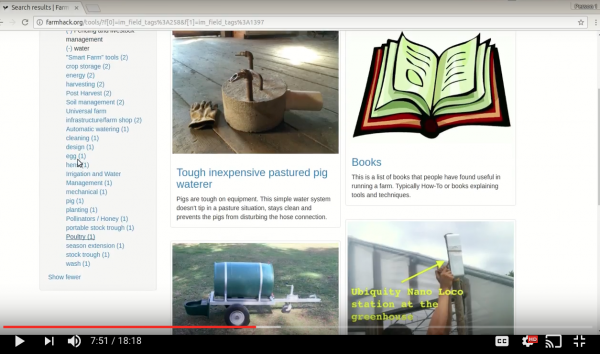 As you might remember, Farm Hack in partnership with Chris Callahan, Agricultural Engineer at University of Vermont, received a SARE grant in summer of 2015 to improve the Farm Hack platform for all users, and specifically for the documentation of SARE-funded tool ideas. Hundreds of really interesting design ideas are funded and documented on the SARE (Sustainable Agriculture Research and Education) website each year, but the lengthy and somewhat hard to navigate pdf database does not facilitate sharing of designs very easily. That’s where the Farm Hack platform came in! 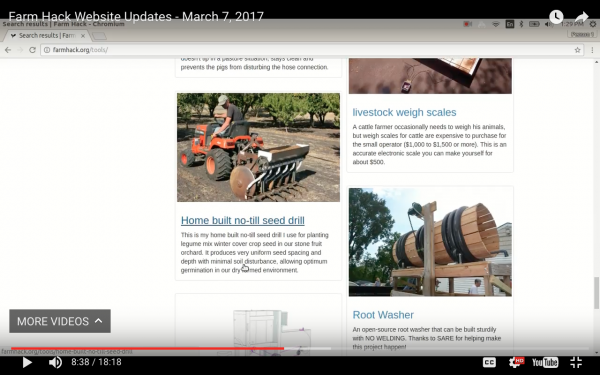 To upgrade the Farm Hack website, we surveyed SARE principal investigators as well as Farm Hack users to glean insight into what features we should improve to add on. In partnership with our software engineer partners we focused on making our growing tool database more easily searchable, and put a lot of work into the tool documentation page to make the process easier and more accessible, and make the resulting tool page more searchable and useful to community members. We also added an “ask an admin” pop up feature to encourage questions and feedback. We are very excited about this next iteration of the Farm Hack platform, and hope it helps move our community towards further sharing and collaboration of useful, well-designed open source farm technology and tools. We want your two cents on the site updates! Feel free to leave a comment on this blog post to start the conversation.